Guns N’ Roses’ Not In This Lifetime reunion run is now among the top five biggest-selling concert tours in music history. Billboard reports that the trio of Axl Rose, Slash and Duff McKagan topped the $475 million mark in gross sales at the end of 2017 to place fourth on the all-time tour list, moving ahead of the fifth-place Roger Waters, whose 2010-2013 The Wall Live tallied $459 million. U2’s 360° stadium tour (2009-2011) tops the list at $736 million, followed by The Rolling Stones’ A Bigger Bang trek at $558 million (2005-2007), and Coldplay’s 2016-2017 shows at $523 million. 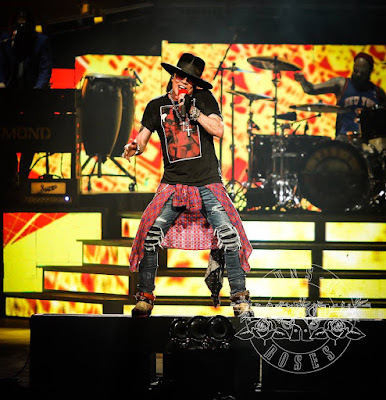 Guns N’ Roses launched the reunion series with a rare club show at The Troubadour in Los Angeles on April 1, 2016; the band have extended the run into a third year and will return to the stage for a series of summer 2018 concert dates across Europe that will begin in Berlin, Germany on June 3. Slash recently revealed that the Troubadour gig felt “very surreal” when he looked across the stage and saw Rose – after almost two decades apart – adding, “And it just snowballed from there. So it’s been 18 months … if you had talked to me 20 months ago, I would have said, 'No f---ing way. It’s never gonna happen.’ But it did, and it was f---ing awesome. Guns N’ Roses were named the No. 2 Rock News Artist Of The Year and delivered the No. 5 Rock News Story Of The Year as part of the 2017 hennemusic Rock News Awards.